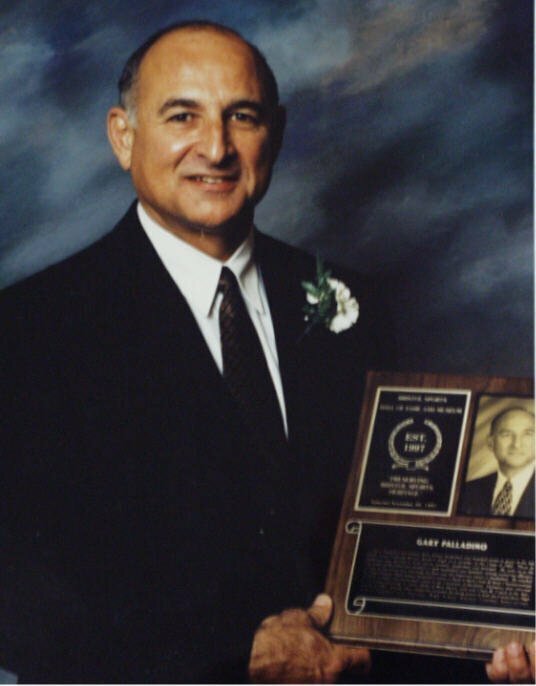 Gary Palladino led Greene-Hills School basketball and baseball teams to glory in the late 1950s before entering Bristol Eastern High as a member of the Class of 1963.There he captained and starred in three sports, football, basketball and baseball. He went on to the University of Hartford and excelled in both basketball and baseball, setting numerous offensive records at the school and attaining All-East and All American status in basketball. He coached St. Paul Catholic High School basketball teams to back-to-back Class M State Championships in 1974-75 before becoming head coach at the University of Hartford. Palladino later returned to scholastic coaching, at Notre Dame of West Haven, and won Class M “Coach of the Year” honors in 1997. Among other endeavors included his being active in both the Connecticut High School Coaches and National High School Athletic Coaches Associations.